Not too long ago, Montreal Canadiens’ netminder Carey Price was considered by many to be the best in the world at his position. But while he’s still an elite goalie, his status as number one on the planet doesn’t exist anymore. The 31-year-old from Anahim Lake, British Columbia has had injury problems over the past few seasons and simply isn’t playing as well as before. 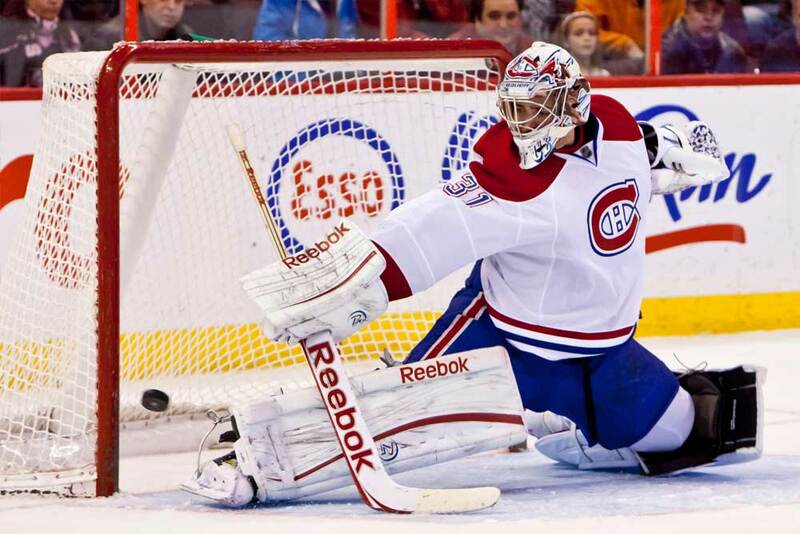 Price was one of the relatively few goalies that was drafted in the first round as he was taken fifth overall by the Habs in 2015. Individually, he’s won just about everything possible during his NHL career except the Calder Trophy, but he was named to the All-Rookie squad in 2007/08. He hit his peak in 2014/15 when he took home the Hart, Ted Lindsay, and Vezina Trophies, shared the William Jennings Trophy with Corey Crawford of the Chicago Blackhawks and was named to the league’s First All-star Team. Winning trophies is nothing new for Price though as he was also named the best goalie in the Western Hockey League and Canadian Hockey League as a junior in 2006/07 and named MVP of the American Hockey League playoffs the same season. Team-wise, Price helped the Hamilton Bulldogs win the AHL’s Calder Cup in 2006/07 as well as leading Canada to gold at the World Junior Championships in 2007 as an all star and tournament MVP. He then led his homeland to Olympic gold in 2014 where he was named the goalie of the tournament. Two years later he won the World Cup of Hockey event. There’s not much this guy hasn’t won, but the Stanley Cup still eludes him. The Habs aren’t considered a legitimate cup contender this year, but if they do happen to make the postseason we all know anything can happen. Heading into the NHL’s Christmas break, Price wasn’t ranked in the top 30 when it came to goals-against average and save percentage as he stood at 2.84 and 90.4 respectively along with a record of 15-10-4 with a lone shutout. In comparison, he headed into this season with a career GAA of 2.46 and a 91.8 save percentage. Price has reached a career milestone in 2018/19 though as he recently won his 300th career regular-season contest with a 2-1 win in Arizona and then beat Vegas 4-3 in overtime in his next outing. This means he’s just 13 wins shy of tying the Canadiens’ franchise record for wins by a goaltender at 314. That mark was set by Hall of Fame legend Jacques Plante and came in the era that didn’t include overtime games and shootouts. It looks like Price should pass Plante in the win department this season and he’s already number one on the franchise list with 588 games played between the pipes. He still has a way to go to catch George Hainsworth for the Habs’ shutout record as Hainsworth posted 75 clean sheets and Price currently stands in fourth place at 41. According to the 6-foot-3-inch, 215 lb Price and his long-time goaltending coach Stephane Waite, they aren’t concerned about personal stats and records though as it would drive them crazy. They insist the only stat that means anything to them is the win column. Waite has been coaching netminders for over 30 years and won a pair of Stanley Cups with the Chicago Blackhawks in 2009/2010 and 2012/13 during his 10-year stint in the Windy City. With Waite’s help, Chicago captured those cups with Antti Niemi in net in 2010 and three years later with Corey Crawford. Waite is now the third goaltending coach to mentor Price in Montreal. Roland Melanson had the job from 2007 to 2009 and Pierre Groulx took over from 2009-13. It seems Waite has been the most successful of the trio due to Price’s record-setting campaign in 2014/15 when he went 44-16-6 with a 1.96 GAA and 93.3 save percentage. He also led the Habs to the Eastern Conference Final the year before. The 2014/15 season was one for the books though as Price became the first NHL netminder to lead the league in wins, save percentage and goals-against average since Eddie Belfour pulled it off in 1990/91 with Chicago. Things went downhill from there however as he suffered an injury and played just 12 games in 2015/16. He bounced back with solid numbers in 2016/17 and it looked like Price was back to being one of the best in the league. The Habs believed so and in the summer of 2017 they signed him to a new eight-year deal worth $84 million. Price took a step backwards once again after autographing the contract as he had to battle through more injuries and posted a 16-26-7 mark last season with a 90.0 save percentage and 3.11 GAA. There were a number of impatient Habs’ fans who believed it was time to peddle their goalie, but also realized it wouldn’t be easy due to his contract. Many of those same fans are silent this season as their team is still in the thick of the playoff race and Price has been rounding into form. Like all other NHL goalies, Price has had to adjust to a few minor equipment rules that have been introduced for netminders. He’s also had to get used to the fire wagon brand of hockey that today’s youngsters are intent on playing. It would be hard to argue that the NHL is the same league today that it was when Price broke into it in 2007/08. It’s more of a free-for-all today now since the league cracked down on clutching and grabbing and a goaltender’s job is slightly more difficult. But as Price said, the only thing that matters is saving as many shots as possible and winning the game.